People With Brain Injuries Heal Faster If They Get Up And Get Moving : Shots - Health News Doctors tell surgical patients to get out of bed as soon as possible, but people with brain injuries are encouraged to rest. Now it looks like activity can benefit brain injured patients, too. Nurses Katherine Malinak and Amy Young lift Louis DeMattio, a stroke patient, out of his hospital bed using a ceiling-mounted lift at the Cleveland Clinic. When Kate Klein began working as a nurse in the Cleveland Clinic's Neurointensive Care Unit, one of the first things she noticed was that her patients spent a lot of time in bed. She knew patients with other injuries benefitted from getting up and moving early on, and she wondered why not patients with brain injuries. "I asked myself that question. I asked my colleagues that question," Klein says. "Why aren't these patients getting out of bed? Is there something unique about patients with neurologic injury?" Doctors have long encouraged their surgical patients to get out of bed as soon as it's safe to do so. Movement increases circulation, reduces swelling, inflammation and the risk of blood clots, and it speeds healing. But that wasn't the thinking with brain injuries, explains Edward Manno, director of the Neurointensive Care Unit at the Cleveland Clinic and one of the neurologists who works with Klein. "The predominant thinking was that rest was better suited for the brain," Manno says. Often the damaged brain is susceptible to lack of blood flow. Increased activity may make things worse if initiated too quickly, Manno says. "So many of us thought for quite some time that we needed to put the brain to rest after the initial insult of stroke or other neurologic injury." 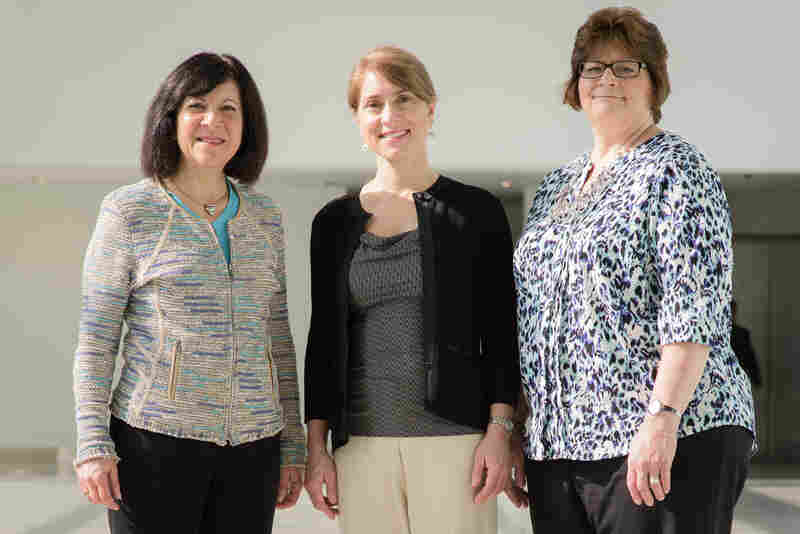 Nancy Albert, Kate Klein and Nancy Kaser collaborated on a study of early mobility for patients with brain injuries. But some doctors, including Manno, suspected patients with brain injuries could benefit from getting out of bed sooner. They just didn't have any proof. Although plenty of research had been done on early mobilization of patients with other injuries, Klein discovered that no one had actually studied whether it was safe or beneficial for patients with brain injuries caused by seizures, stroke or head trauma to start rehabilitation right away. So she designed a study of her own. Over the course of a year, Klein tracked more than 600 patients with brain injury, getting more than half of them up and out of bed as early as the first day they were admitted to the ICU. What she found was that getting up and moving had clear benefits. 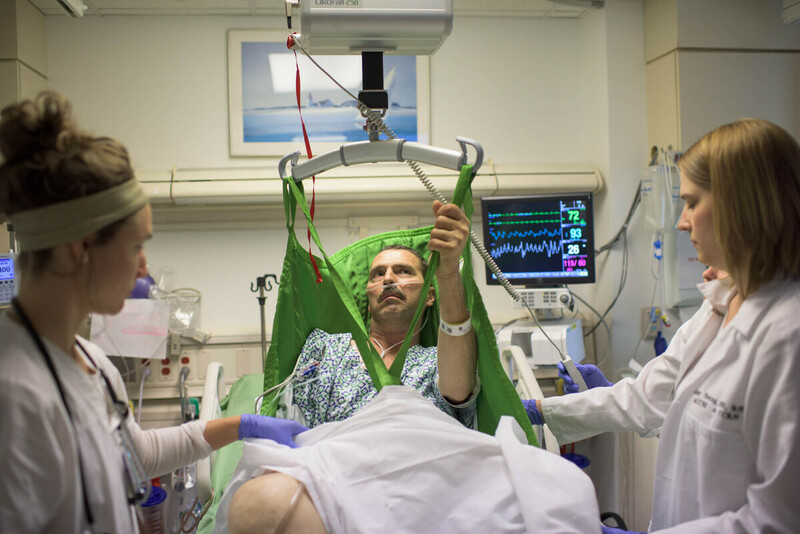 Patients who started their rehabilitation earlier spent less time in the ICU and less time in the hospital. "They have less pressure ulcers, less infections and spend less time on the ventilator if they need ventilator therapy," says Klein. And most say they feel a lot better. One of the barriers to getting patients with brain injury up is how difficult it is. It took two nurses more than half an hour to get patient Patricia Weeden out of bed and into a chair to visit with her daughter. Weeden, 66, from Cleveland, has suffered severe seizures that damaged her brain. She's hooked to a ventilator, so she can't speak. And she's unable to sit, stand or walk on her own. "It is difficult to get these patients up," explains Klein. As a result of her study, the Cleveland Clinic has installed ceiling mounted lifts at each patient's bedside in the Neurointensive Care Unit. Nurses receive other equipment and training to make moving patients safer and easier. And although it seems like a lot of effort for a few steps from bedside to chair, Klein says it represents huge progress for a patient like Weeden. The benefits may go beyond preventing bed sores or infections. Manno says it may also speed the recovery of the brain. The brain rewires itself, explains Jeffrey Kleim, an associate professor of biomedical engineering at Arizona State University who studies what happens to the brain after injury. "And it does this by forming new synapses, forming new connections," says Kleim. "The neural circuits begin to change and adapt, and that's how these new functions begin to emerge in the remaining brain areas." That neuroplasticity has been shown to be heightened immediately after injury in studies with animals. If the same is true in humans, the sooner patients get up and engage their brains the better their chances of recovery. Kleim says much of the animal research has been focused on finding ways to jumpstart the rewiring process with drugs or electrical stimulation. But in people, he says, there is a much simpler way to drive the recovery process. By getting patients up and out of bed early, even taking them outside, Klein and Manno say they are attempting to provide the sort of familiar experiences that are already known to stimulate the brain's natural rewiring process. Those experiences can be powerful, explains Klein, recalling a patient who suddenly began to speak after being outside for the first time. "She was listening to the traffic, feeling the wind on her face, and then her sons came and they said 'Hi Mom,' and she looked up and said, 'Well, how are you doing?' Those were her first words," Klein says. But as dramatic as those moments are, Manno says they only illustrate how much we still don't know about the recovery of the brain. For example, it's still unclear if all kinds of brain injuries can or should be treated the same. "We are just scratching the surface here," says Manno. "There's a tremendous amount of work to be done in this area."